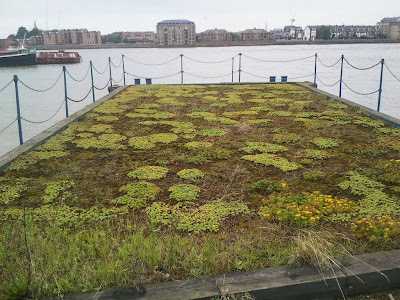 Named after the former Alcatel factory - found on a site where the world’s first transatlantic cable was manufactured in 1858 - The Alcatel Jetty is a disused industrial jetty on Greenwich Peninsula which has been planted with mosses and sedum in order to provide a habitat for local birds and wildlife. We are told that wagtails, black redstarts and cormorants might use the jetty and -whilst it is deemed unsafe for people to go onto it - it is thought to be a pleasant and interesting alternative to demolition. For more, click here or read Ian's tour of the area.